Cliches get a bad rep: “don’t judge a book by its cover,” “the early bird catches the worm,” “fighting like cats and dogs,” and so on. You’ve likely heard dozens of these common sayings, as well as been warned off using them altogether. But why? It’s not because they’re not true — if anything, they’re too true. Consider the cliche “a picture tells a thousand words.” Content marketers ought to take heed, at least, because this seemingly worn-out axiom holds wisdom that applies today. Crafting the highest quality content possible isn’t possible without the pull of visual imagery. Photography in marketing is often taken for granted. Yet when focused on and elevated, marketers can add a whole new creative dimension to website content that engages audiences, enhances blog posts, stands out on social media and grabs people’s attention. The visual element is a powerful one in content. Though it might not have a ton of impact on rankings from search engines, in many ways imagery has become essential to success in some channels, like social media marketing. Images of all kinds are increasingly popular in content, like GIFs in blog posts, infographics, screenshots, memes and videos. Each has a potential use given the content type or the channel — but what we’re focusing on is photography and how you can incorporate it into a marketing strategy. 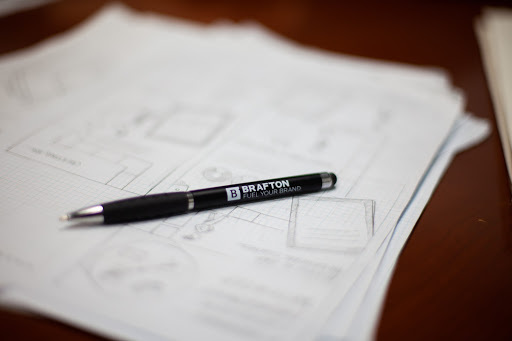 Just take a look at some of our own examples sprinkled throughout. 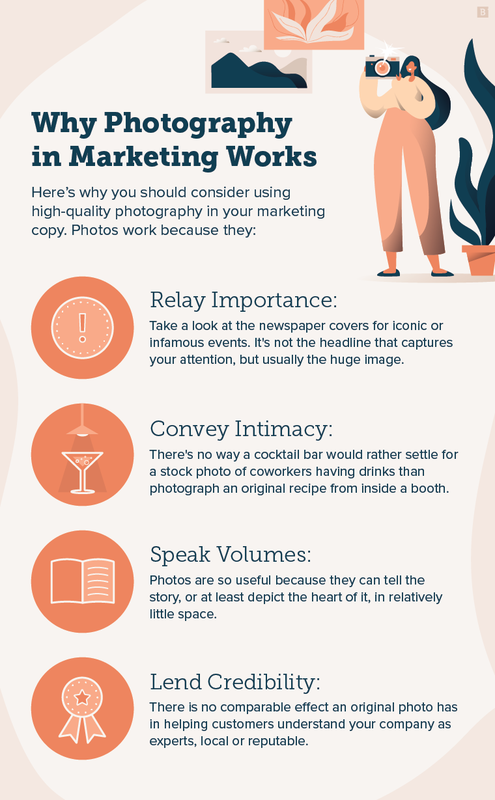 Here’s what to know about incorporating photos in marketing, plus some photography marketing ideas you can start with. First, let’s look at what the numbers have to say about the use of imagery in content, because they make an incredibly strong case for doing so. It’s already well-known that visuals attract the eye wherever we happen to be, that’s why billboards are still a thing — thanks Shen Yun! And while advertising has always been a visual medium, content marketing is starting to catch up. A Cision report found press releases with photo multimedia received 1.4 more views than text-only releases, while those with video earned 2.8 more. Visuals on social media are a hot ticket: Data from MDG Advertising shows images on Facebook get 352 percent more engagement than links. 41 percent rated beautiful imagery as a characteristic of a positive experience. 44 percent said they’d ditch reading a page altogether if the images weren’t loading correctly. Content marketers across industries have gotten the picture and have poured serious marketing efforts into boosting the imagery of blogs and other content forms. In a 2019 survey of B2C marketers by the Content Marketing Institute, 63 percent said they increased their use of images — like photos — compared to the year before; 56 percent of B2B content marketers said they’d taken similar steps in a separate CMI poll. Too often the concept of photography used for marketing is boiled down to the inclusion cringe-inducing stock photos. Venngage, a design software firm, asked businesses what type of visuals they most commonly used in 2018: 40.2 percent answered stock photography, this despite 12.5 percent overall rating stock photos as the best performing image type. Compared to the thousands of GIFs available or the simplicity of a screen cap, professional photography seems more involved or costly, even if it involves real people. But dedicate some real marketing effort to producing quality imagery and you’ll discover internal photo shoots are low-touch alternatives that work magic. Imagine the quality of photos taken in-house by a boutique versus what the same business could find online. Not only can employees model the clothes they sell in the shop, but snap the photos as well. Online options, even from niche stock photo vendors who may specialize in fashion, probably can’t come close to the authenticity, artistry and sheer efficiency of internally produced images, which will resonate on a much deeper level with an audience. Who knows, a local photography business might even be willing to lend its services in exchange for some marketing help. There’s no substitute for having still images of your products, your people or your place of business. 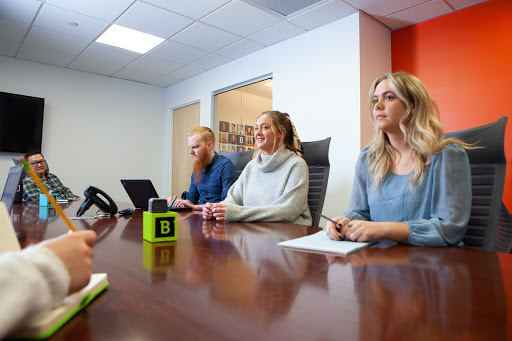 It may take some investment — 32 percent of businesses directed more than 30 percent of the digital marketing budget on producing visuals in 2019, versus 17 percent who did the same in 2018, according to Venngage— but there is absolutely a place for original photography, whether done by your own staff, a professional partner or Annie freakin’ Liebowitz. Before ramping up the visibility of photography in your content, consider its basic advantages. Grasping the fundamentals of why an original photo works better than a white-background stock photo will enable content marketers to concept, design and produce high-quality visuals. Relay importance: Take a look at the newspaper covers for iconic or infamous events, think natural disasters or presidential elections. It’s not the headline that captures your attention, but usually the huge image that tells you immediately “look here, this is important.” Sure, the tactic sells copies for publishers, but it is also extremely effective as a tool for brand awareness in content marketing. Convey intimacy: Half the world is familiar with “Harold,” that bearded, smiling goon of stock photo ignominy. Is there anything worse than a stock model gazing unnervingly and unrelentingly at people from the page? Unlikely. OK, not all stock photos are that bad, but the stiff and contrived feel of most turns off many visitors. Imagine trying to use one on social media. There’s no way a cocktail bar would rather settle for a stock photo of coworkers having drinks than photograph an original recipe from inside a booth. Dim the lights and you’ve created an intimate atmosphere that your Instagram audience can buy into, and which cannot be replicated by many commercial options. Speak volumes: Alluding back to that cliche about saying a thousand words, photos are so useful because they can tell the story, or at least depict the heart of it, in relatively little space. Imagery doesn’t have to replace text, but rather summarize or emphasize it, working as a complementary design element in blog posts, case studies, social posts and other content forms. Photos are valuable to the reader who scans or has competing interests, which is just about every target audience these days. Content marketers can use imagery to cut through the noise or cut to the chase — there are another two cliches for the grammar Illuminati. Lend credibility: Original photos are a no-brainer if a small business really wants to tell an online audience and clientele about itself, its mission, its product and its story. While businesses, like a law firm, health care clinic or auto shop, may certainly be able to find ample stock options, none could probably approach the effect an original photo will have in helping customers understand the company as experts, local or reputable. GIFs, infographics and videos all have a rightful place in the marketing strategy, but their strengths differ. GIFs add humor, while infographics demonstrate knowledge and videos engage users. Photography can blend all these advantages into a single medium, giving content marketers a powerful tool. Amateur filmmakers have shot whole movies using smartphones and went on to enter them in festivals or otherwise gain acclaim; similarly, there’s nothing stopping businesses from getting high-quality results from lesser resources. Fast food chains spend hundreds on crews to beautify and photograph their offerings, but a catering business doesn’t need all that fanfare, just one or two cooks, a smart device with a camera and some lighting. The approach is comparably lo-fi, but sure to have website visitors salivating over a real menu choice. Bartering with other local businesses can achieve a mutually beneficial arrangement wherein content marketers without photography skills or equipment can access such professional services, while perhaps assisting the photo shop with marketing help. Wedding photographers can practice their trade in many other settings, and businesses in need may want to inquire about working out an agreement. Or, venue management firms that host weddings and receptions may be able to forge close ties with photographer partners by referring each other to couples planning their big days. Testimonials are powerful assets to increase brand awareness and trust. While a case study might help sway a prospect who’s further down the funnel, think about the impact a social photo essay of sorts could have in increasing your brand profile. Other followers who can see your products being used by real people is a huge co-sign. If you have an expansive following across social networks, tap some of your most avowed brand evangelists for promotional photos, like of their dog with a custom neckerchief or a selfie sporting makeup they ordered. You can also start a social media competition encouraging followers to submit their own photos. Just make sure to get permission to reuse any third party’s photography in content marketing, either in this exact case or any other where use has to be approved. This is the surefire way to publish content that’s important and relevant to your target audience. Those perfect pictures aren’t going to snap themselves. Instead of waiting for that opportunity to present itself, create the chance for photogenic moments by hosting events, getting involved in the community, attending conventions or trade shows, working with other businesses or just being social in any sense. For instance, the lawn care company that volunteers to help clean up a neighborhood park has the ideal situation to do good, record it and communicate that message visually to a local audience. Either hire a professional photographer to accompany or ask employees and others to help commemorate by taking their own pictures. Now, the CMI would warn content marketers away from using stock photography. This argument has a lot of merit — we’ve already torched stock photography many times up to this point — but in some cases, businesses may have no choice but to use this option. Time is money, and such resources are often scarce; not every small business may be able to pursue photo shoots frequently enough to supply all their visual content needs. Twenty20: This vendor is more like the art house of the stock photo scene with a wide library of creative and stunning photos shot in professional and personal settings. Unsplash: With similar stock collections to Twenty20, Unsplash can help content marketers add gravitas with a black-and-white portrait or spark the imagination with a scenic countryscape. Websites will have different licensing fees and restrictions on use, however, so it’s crucial you research the terms of business before buying any stock images from any provider. Misuse of copyrighted property could land you in seriously hot legal water — which makes original photography all the more appealing. Most content marketers know that visuals are great for engagement. 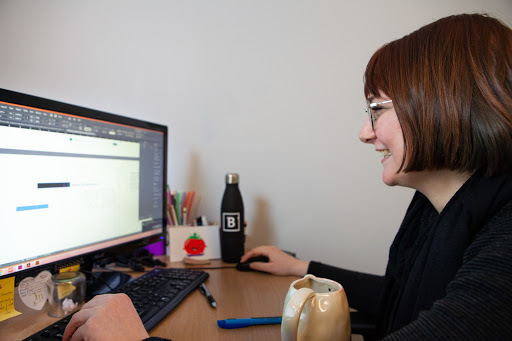 But if you really want to connect with a target audience or email list, consider adding original photography in your marketing. Such imagery has high potential to resonate deeply with potential customers, as well as depict your brand in the best possible light.